One thing that really irks me is waste in the kitchen. When food is composted money is wasted. And when you grow your own, that’s your time going in the compost bucket, too. Sure composting the waste is better than tossing it in the landfill. But I like to squeeze every bit of goodness out of every morsel that comes from the garden. Don’t you? I have a Breville Juice Fountain Elite Juicer. In the fall, when the harvest is in and carrots and beets are fresh, I like drinking fresh vegetable juice in the morning. But I hate the idea of throwing 8 cups of carrot and beet pulp to the goats every day, or worse, into the compost. I dried a bunch of the juicer pulp in the dehydrator which gives me some to add to soups and stews all winter. But there is still more pulp than I can use. 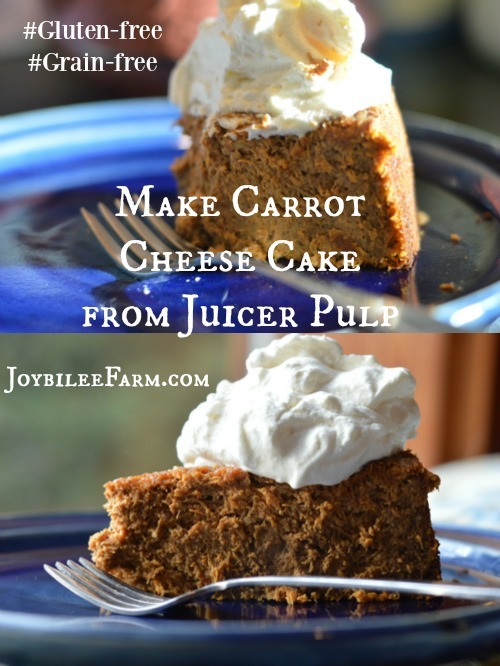 This carrot cheese cake uses the carrot pulp from making carrot juice in the Breville Juice Fountain. To get the pulp, I put the carrots through the juicer, before I add any other fruits or vegetables. I pull out the carrot pulp and put it in a mixing bowl, and then put the juicer back together and continue juicing the beets, ginger, apples, and lemon, or whatever. The cheese cake is easy to make. The texture is a little grainy. If you prefer it to be smoother, add the first 4 ingredients to your Vitamix blender or another powerful blender and process till smooth. Then proceed with the recipe. This is gluten free, grain free, and low on sugar. The carrots add their own natural sweetness. 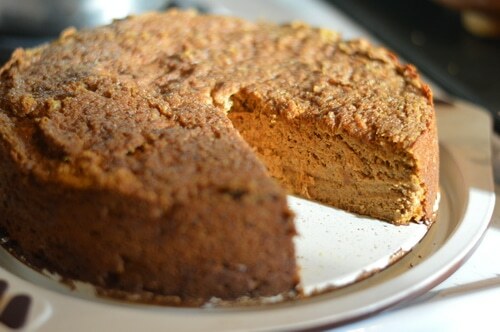 A lightly sweet cheese cake make from the pulp left over from making carrot juice. Sort through the carrot pulp left over from making carrot juice. Remove any larger pieces of carrot. Measure the carrot pulp by pressing it down into a cup measure. Set aside. In a large mixing bowl, cream together sugar, cream cheese, and olive oil. Add eggs and beat well. Add carrot pulp, milk, and spices and beat well. Add pecans and baking powder. Lightly butter the bottom and sides of a 9 inch springform pan. Pour in the batter, leveling out the top with a spatula. Preheat oven to 375°F. Put the pan in the oven. Bake for 15 minutes. Turn down the heat to 325°F and continue baking for another 30 minutes or until the surface is golden brown and a knife inserted into the centre comes out clean. The centre will be soft and not springy, if you press on it. Remove from the oven and cool for 5 minutes. Remove the outside ring of the springform pan and continue cooling on a rack until the carrot cheese cake is completely cool. Place in the fridge or freezer to chill it for at least 2 hours or until you are ready to serve it. Beat whipped cream in a mixer until it forms soft peaks. Serve as a topping over the cheese cake. Make whipped cream for topping the cheese cake immediately before serving. 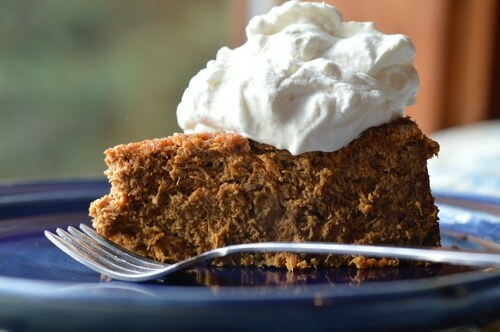 Take 1 cup heavy cream, 1 tsp organic sugar, and ½ tsp. vanilla extract and add to the mixing bowl of your stand mixer. Using the whisk beater attachment, whip the cream until it forms firm peaks. 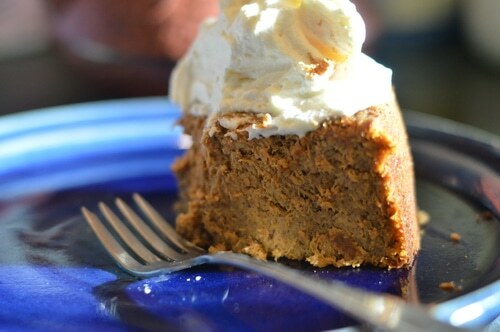 Serve 1/4 cup on each slice of carrot cake. (makes 2 cups of whipped cream). Enjoy this easy to bake cheese cake any night of the week. It’s not too sweet , and good for you, too. So there is milk in the ingredients but not in the recipe? 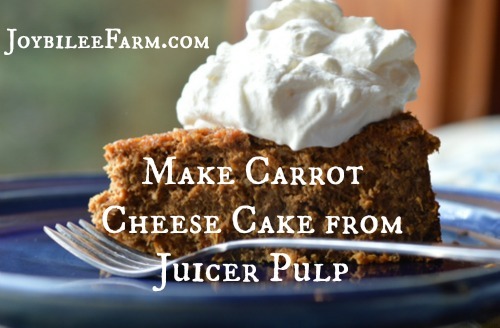 Did you dehydrate your carrot pulp before you baked this recipe? Mine turned out very moist (I baked it an extra 20 minutes trying to get a clean knife from the center) and then crumbled too easily. I only chopped my pecans but I’ll grind them next time. I used rice malt syrup instead of honey to lower the glycemic effect and sprinkled extra cinnamon for a little extra flavor. No I used it fresh.